Measurements: 2.75 x 4.7 inches; or 69 x 119 millimeters. Back of card: Solid black field with four dagger-like stars in the corner. Booklet included: Yes, 49 pages, 2.8 x 4.75 inches, or 71 x 120 mm. Publisher: Carta Mundi. Printed in Belgium. Comments: Here the idea was to use photographs to show tarot images. 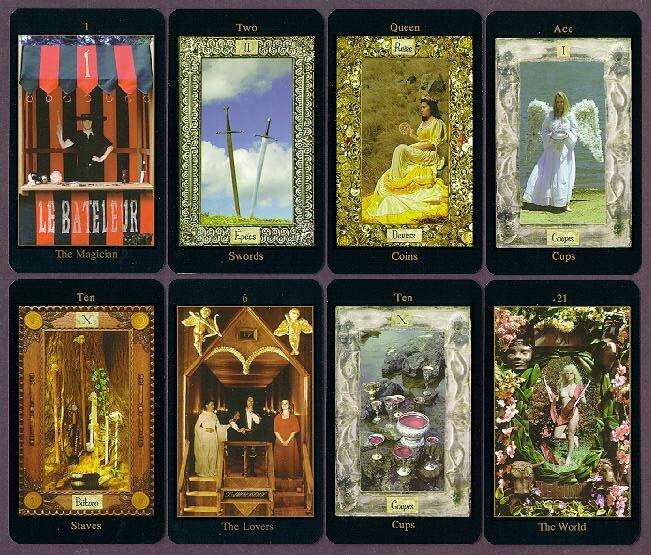 Photographic tarot cards are not an original idea. Scanning the cards for the display above actually improved them. As so often happens in copying, contrast increased. Since most of the cards are muddled in contrast, what you see above does not exactly reflect the cards themselves. The Magician is not as bold as he appears above. Subject matter in the major arkana cards is small & dimly lit. The photographer has a hard time getting close enough to his subject & cannot seem to light any of them properly. In a note from the author, the cards, inspired by the Marseilles deck, were scale models, photographed from 10 inches/24 cm. In the minor arkana, the court cards (King, Queen, Knight & Page) are people in slightly different costumes, in about the same pose, each holding one of whatever the suit is. The Ace of each suit is a woman in an angel outfit, holding one of whatever. The pips are the same shot with more (or less, depending on how you approach it) of the same object: Ten swords sticking into the sky, then nine, then eight, then seven, etc. The master shot for Swords & Cups is okay, the ones for Wands & Coins are not. The Coins you can see dimly, the Wands are all but impossible to discern (see above). It is possible to do a photographic treatment of the tarot, though speaking as a photographer myself, I don't think photos are the best way to express tarot energies. In any case, bolder, bigger, more creative shots are needed for this idea to succeed. And why not combine bunches of photos into one card? This is a new deck (1995). The author says it's already in to its second printing. We wish him & his creation well.